Fall is coming, and orders for our fall themed items are through the roof! We love your support — and we love autumn. What a gorgeous time for a bridal shower. Since so many of you have asked for tips on hosting a fall bridal shower, today I’ll be talking about how to create the perfect party. Read on for all the fun fall details. Fall can be a tricky season in some climates, but if the weather allows, hold the shower outside. Rent or buy (or borrow, if a friend has one) a pretty party tent. This way, if it’s overcast and drizzly, you can continue the party outdoors. Have an indoor backup plan in case of more severe weather. Clear out some space in your living or dining room, set out a pretty tablecloth and have plenty of seating available. Decorate the area with faux leaves, vines, autumn fruits and nuts. Believe it or not, I’ve found quality renditions at my local dollar store! Decorate the tent, chairs and table. You can also use faux autumn foliage as a table centerpiece. If it gets chilly in your area in the fall, you may want to look into renting some safe outdoor space heaters. Pretty place card holders set the theme. Send out autumn theme or autumn colored invitations. If you’re e-mailing invites, choose a template in fall colors. 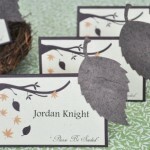 Put out fall theme place cards for an elegant touch. As a special service to the bride-to-be, buy autumn thank-you notes. Give them to her after the shower. That’s one less purchase for the couple; they’ll appreciate the thought. 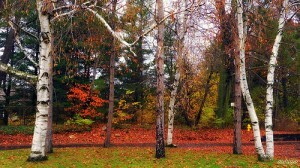 Choose favors in autumn colors or with a fall type feel. You don’t need to break the bank on these. Either the favors themselves should have an autumn theme, or they should be placed in fall-colored bags or boxes. Chocolate covered nuts, chocolate or candy covered sesame seeds, or fall colored and/or scented candles are great choices. Take advantage of the produce of fall by serving up nature’s bounty. Check out your local farmer’s market for fresh fruits in-season. Serve nuts. You can roast your own nuts with either a sweet or savory flavor simply by placing them in one layer on a Pam-sprayed baking sheet and sprinkling with flavors. For a sweet flavor, sprinkle cinnamon and sugar. Yum! Buy or make apple cider and serve in pretty glasses. Bake flavors that include pumpkin, cinnamon, nutmeg and brown sugar. Pumpkin bars or squares are a delicious choice. Finish with a nice gift for the bride-to-be. A pot full of chrysanthemums or mini sunflowers is a pretty idea that’s fall-themed and should last for quite some time. This can also double as a party centerpiece. Have fun with this theme — fall is ripe with creative ideas for any party and will make your shower absolutely gorgeous.